On tonight’s webinar we will demonstrate the installation of the eMonitor in Rogelio’s home. The eMonitor is arguably the best of the “circuit by circuit” monitors available today. Studies have found savings of 10 to 30% just from having good feedback about energy usage. Most people are surprised to find out exactly where their electricity is going. Sometimes when we know how much something is costing, we decide we don’t need it that much. Typical of these surprises are that extra (old) refrigerator in the garage, and various electronics in the home office and entertainment center. Tonight we’ll install a 12 channel unit which will connect to the Internet with an Ethernet cable. In a subsequent chapter we’ll connect with a “bridge” wireless gaming router and also another application which will monitor 24 channels. There is a real need for good Home Performance Data. We’ll be installing these units on all of our houses in the future as well as our existing inventory and our own personal homes. We’ve negotiated favorable pricing for the eMonitor for those who would like to participate and contribute data as they install Home Performance measures on their homes. A blog page will be provided for each participant to record the anecdotal experience of living in the home as it gets more and more energy efficient. Tune in tonight and help us design an efficient Data Gathering Program. Tomorrow’s Field Trip: Wednesday January 4th we will have a Field Trip of finished homes in Fresno and Clovis. We will see the monitored Lab House, The recently completed home on San Madelle and Rogelio’s completed home with the E-Monitor installation. After lunch, Jennifer will show us the best candidate (s) for our next purchase. We’ll tour the home and estimate the costs of renovation and discuss the new exit strategies. Please RSVP as Brenda is preparing awesome Mexican Food. Meet at the 5666 N Blackstone Fresno CA McDonalds at 10:00 AM. We will journey to 1205 E San Madelle, then to 440 N Homsy (DOE-IBACOS project). Click here to watch a streaming version of this webinar. 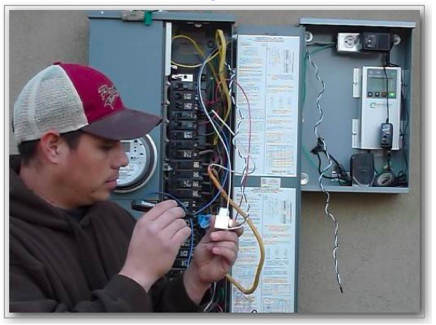 This entry was posted on Wednesday, January 4th, 2012 at 3:54 pm and is filed under Energy Package, EnergyWise House Flipping, Home Performance, Renovators Webinars. You can follow any responses to this entry through the RSS 2.0 feed. Both comments and pings are currently closed.